One of the most popular pets in America, dogs are a natural favorite among young and old alike. Unfortunately, this love often comes at a price. According to americanpetproducts.org, Americans spend an average of $1,641 on their dogs every year between the toys, food, vet visits and everything else that dogs need.Thankfully, just because some people spend thousands of dollars on their pets every year does not mean that you have to as well. 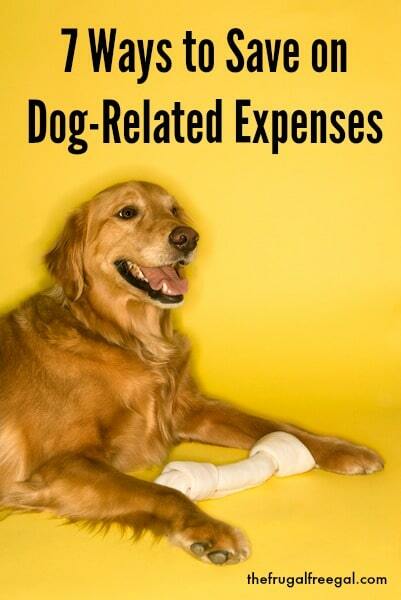 Here are seven ways to save on dog-related pet expenses that you can try today. Try one or try them all–your wallet will thank you. Do you find yourself shopping at the same pet stores time and time again? Ask if they offer any sort of loyalty discount for shopping at their store. The sign up process is usually quick, easy and free, and you can start saving money right away. Do be careful about signing up for store credit cards or any type of program that requires you to spend a certain amount, however. You don’t want to pay more in fees or interest than you save by using the card or program in the first place. For dog supplies you go through quickly, particularly dog food, you may want to purchase in bulk, preferably when they are on sale. You can save yourself a great deal of time and money by purchasing large quantities less often than by grabbing the small bag every time you are about to run out. Check stores like Costco, Amazon and other online pet supply retailers to see what sorts of bulk discounts you can find. Do keep in mind that cheaper isn’t always a bargain, however. Purchase cheap dog food and you may find yourself with vet bills after a while. Purchase cheap dog toys and you may find yourself replacing them constantly. Don’t consider just the price when purchasing items for your dog; consider the value as well. Some things are worth spending a little more for. Check out the reviews on dog toys before buying! While the price of pet supplies is often non-negotiable, the cost of the services your pet needs can sometimes be negotiated, especially if you choose an individual provider or small business for your services instead of a corporation. The next time you take your dog for training, grooming or to the vet, don’t be afraid to ask if the price is flexible. You may be able to take advantage of a two-for-one or percentage off deal, or you may be able to get certain upgrades or extra services for free. Are you considering choosing a new brand of dog food but you aren’t sure which type your dog will enjoy? Why not write a few dog food companies and request a free sample? While you probably won’t get a large amount of food this way, you can save yourself a fair amount by not having to buy several full sized bags to find the brand your dog likes. If you’d like to try a few new products, this is a great, low-risk way to get them. You pay for health insurance for yourself and your family. Have you ever considered purchasing health insurance for your dog? Every dog will need to visit the vet at some point, and you never know when that huge, unexpected expense will occur. Arm yourself in advance by looking into dog insurance, especially if you have reason to suspect that your dog may have health issues either now or in the future. If you love dogs and dog products and want a great way to get tons of great, new products for cheap or free, you may even consider starting a blog about pets in general or dogs in particular. Oftentimes companies will send bloggers free products in exchange for their honest review. Grow a quality blog and you may just be surprised at how many free products and opportunities you receive. Sign up for a BarkBox subscription box for your dog so that you can have products sent to you to try. Every BarkBox has at least 2 innovative toys, 2 all-natural bags of treats, and a chew, curated from each month’s unique themed collection. Your dog may be your baby, but that doesn’t mean that he needs to be as expensive as another person. Use these seven tips to keep your dog costs low and spend your days enjoying your dog–not working to afford him. Thank you for posting this. I have a cat but I think the post is applicable to cats too. Good ideas! kristiedonelson(at)gmail(dot)com Thank you.